Authentic rustic house in Pedret i Marzà with pool and garden. Interior with 7 rooms and 8 bathrooms and large open spaces. 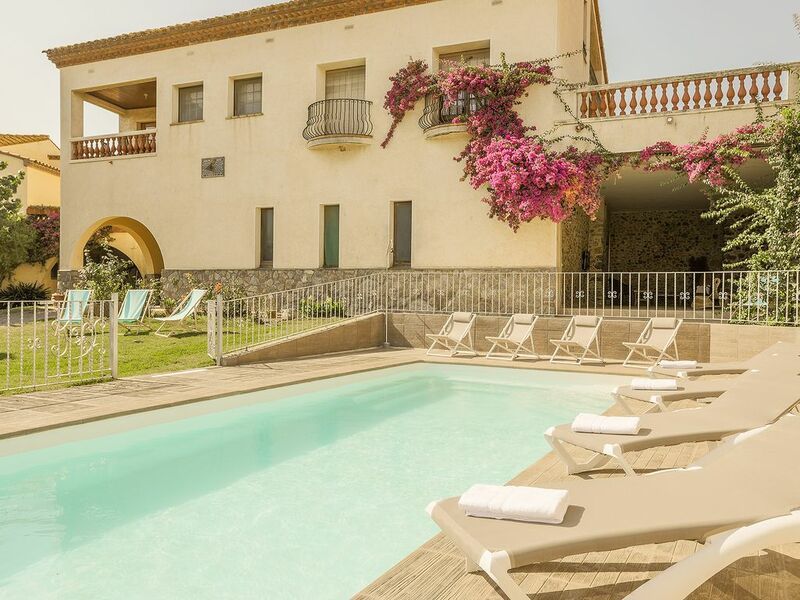 Only 15 minutes from the beach in the heart of Alt Empordà. Can Dalmau is an authentic rustic village house in Pedret i Marzà in the middle of Alt Empordà. Only 15 minutes from the beach and surrounded by the natural park of Albera, the Cap de Creus and the Aiguamolls del Empordà. A town where you can enjoy the calm and tranquility next to many tourist attractions in the area. It has large and diverse common spaces, which makes it unique since it has a lot of capacity but at the same time offers privacy. The Can Dalmau estate has two houses. One is for full rental for the guests and in the upper floor of the second live the couple of dear owners who have their own access. The garden and all exterior space is exclusive for guests who rent the house. The house has 7 bedrooms and 8 bathrooms. On the lower floor we find the kitchen open to the dining room, with TV and fireplace, two double rooms and a triple room, all of them with bathroom. Going up the exterior stairs we access the top floor, where there is an independent triple room with bathroom and terrace overlooking the garden and the mountains, a small bright room with TV, three double rooms (one with bathroom), a auxiliary kitchen and two more bathrooms. Accessing through the garden, in the second house, we also find a large indoor games room with vaulted ceilings and stone walls where there is billiards and ping pong, and a room with a large sofa and TV. The whole house has heating and free WIFI. Outside we find a porch with stone walls, where there is also a chill out space with TV, the crystal clear pool of turquoise waters completely fenced, a space with swings, the barbecue and the table, where you can enjoy the fresco under the shade of the great banana tree that presides over the garden. You will feel an explosion of colors with the lilac bougainvillea that surrounds part of the house. On the farm there is a herd of calves that you can visit, you just have to ask the owners. A space to enjoy the song of birds in the midst of the calm of this town strategically located in a unique place.